In the second half of 2003, Benet got the chance to return to his first love of musicals when he was asked to direct a new production of the musical Sweet Charity for the long-established Wimbledon Light Opera. 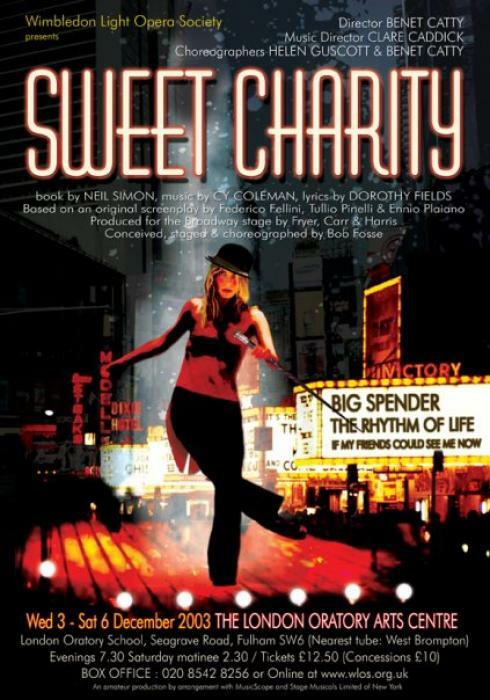 Fast, funky and funny, Sweet Charity is the story of Charity Hope Valentine, a young dance hall hostess struggling to find a man, any man, who can make her happy. The first throws her in a lake. The second locks her in a closet. But the third, Oscar, is something else. When the two of them get trapped in an elevator together, it’s clearly the start of something new. But will it be something different? Benet brought two main ingredients to this production of the classic musical. The first was minimalism – three quarters of the show took place on a bare stage with only a minimum of props and furniture but using a spectacular pastiche Broadway lighting design to delineate the different areas. The second was movement - working with the fantastic young choreographer Helen Guscott he staged everything using a style which was recognizably Bob Fosse’s (the legendary original director) but which was at the same time very much its own. These two strands of the production gave it a genuine ensemble feel. Nearly everyone in the cast had their own ‘moment in the sun’ or played a particular character all evening; quite contrary from the writing of the show which is weighted very heavily towards the principals. This ensemble staging went well beyond the big set piece numbers, incorporating even the scene transitions which were choreographed to the music and became every bit as much of the show as the scenes they were linking. The production proved to be a great success for Wimbledon Light Opera, as Benet was allowed to incorporate his knowledge of marketing to develop a professional graphic design far in excess of what most amateur companies achieve, and to use his long-established experience in lighting to create a vivid and spectacular design which was the hallmark of the visual presentation of the show. The show benefited from the sound of a superb 14-strong professional orchestra under the direction of Clare Caddick. Served by an exceptionally strong group of dancers, two superb lead performances from Marianne Hare and Jonny Storey, as well as terrific comic support from Fiona Weir and Mary-Anne Roddy, the cast of 35 varied widely in age and experience but were united by their enthusiasm and effort. Nineteen weeks of part-time rehearsals on easily the most challenging and exhausting production of Benet’s recent experience were found to have paid off as the nightly ovations from near-capacity audiences showed.